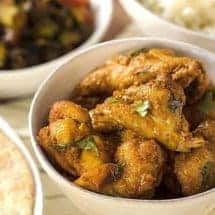 Fennel and chicken is a very popular combination in many South Indian Dishes and this Low Carb Keto Air Fryer Fennel Chicken recipe is a great, fast, healthy dinner. Somedays I have a recipe idea in mind and then I go into the kitchen to create it. Somedays I stand in the kitchen quite lost, until I come up with something that sounds good. Other days I have a TASTE I’m trying to create. This Spicy Fennel Chicken was one of those. I love fennel seeds. It’s not a very commonly used spice in the U.S., and when we do, we use fresh fennel. But fennel seeds form an important part of many dishes including this Masala Chai Recipe. The fennel in this dish really elevates it to something different. I know many of you will write to me to ask what to substitute for Fennel–but I honestly don’t know. I mean, this is Fennel chicken. If you subbed something else, then it wouldn’t be Fennel Chicken now, would it? 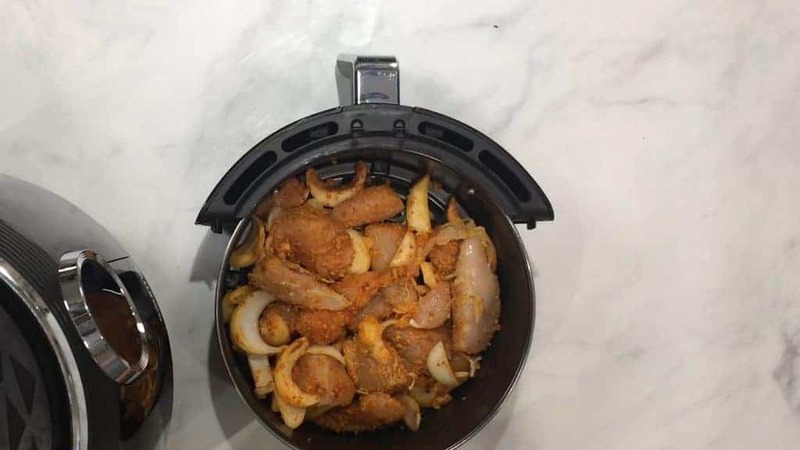 So I’d suggest you get some Fennel Seeds and make this Air Fryer Spicy Fennel Chicken. I know some of you like process pictures and others don’t so I will try to keep this section short but relevant and hopefully, helpful. Get all your ingredients together. It’s really chicken, onions, and a bunch of delicious spices. Since this is a simple, pour and cook recipe, you’re going to mix everything but the cilantro in here. So Chicken, onion, ginger, garlic, ground fennel seeds, smoked paprika, turmeric, cayenne, garam masala, and salt. 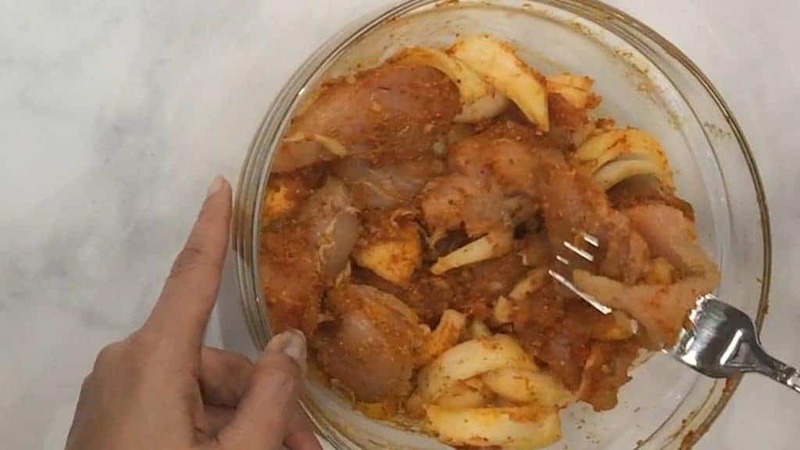 You need to pierce the chicken with a fork to get all the spicy goodness to penetrate the chicken. Now, let it marinade. 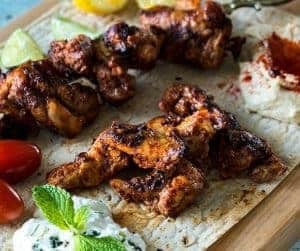 There’s nothing acidic in this marinade that will cook the chicken, so anything from 30 minutes to 24+ hours is probably just fine, as long as you keep it refrigerated. 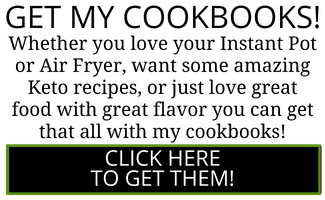 Okay, see how it looks in that air fryer basket? There is definitely some overlap in the chicken, but it’s not like it’s all piled higgledy piggeldy on top of each other. So you want to get as close to a single layer as possible, but don’t sweat it. That chicken will shrink as it cooks anyway so it’s not going to be a huge issue. 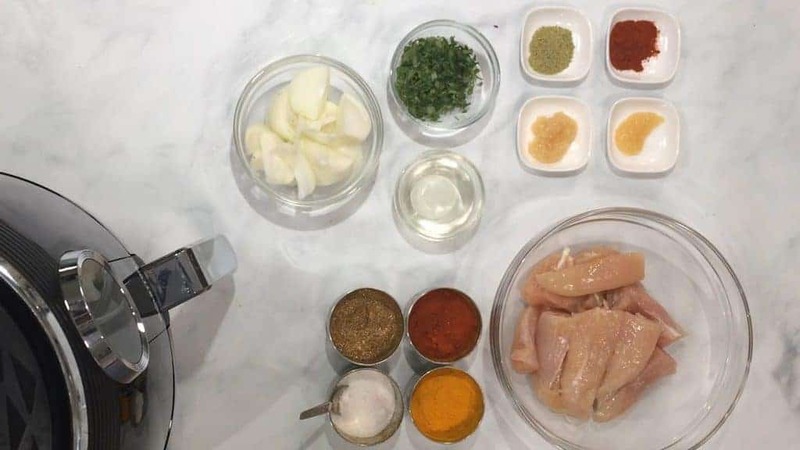 You really want a good thermometer to check the temperature because, with so much spice, sight alone won’t tell you if your chicken is cooked. Also, see what I said earlier about the chicken shrinking as it cooked? Now you can add the cilantro and the lemon juice, and you will be good to go! 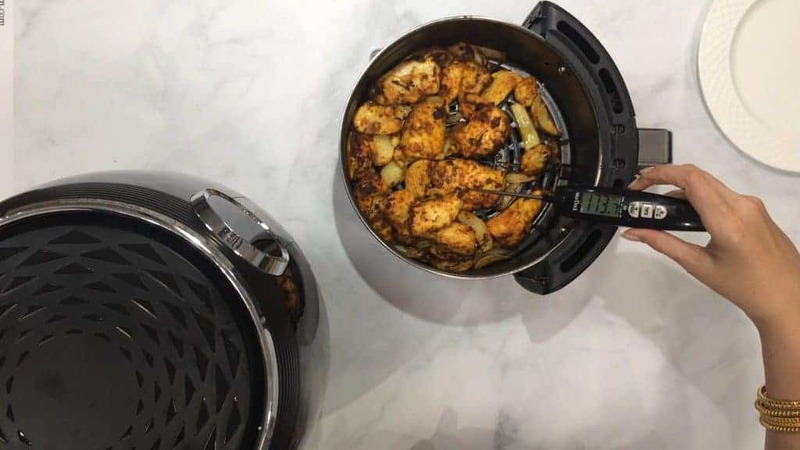 Fennel and chicken is a very popular combination in many South Indian Dishes and this Low Carb Keto Air Fryer Chicken recipe which is a Spicy Fennel Chicken is a great, fast, healthy dinner. 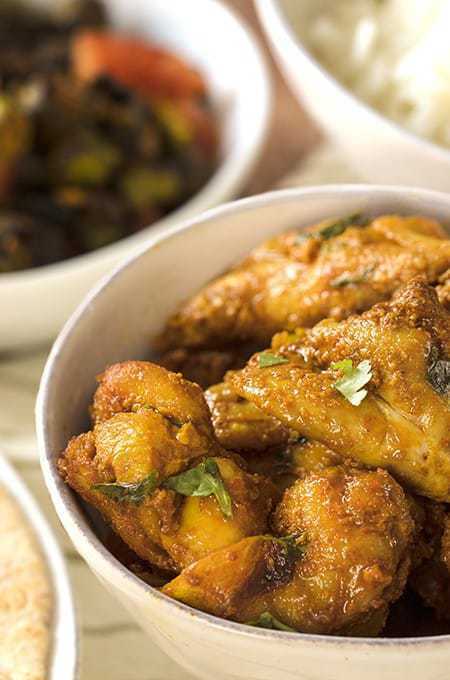 Make the Chicken Fry: Using a fork, pierce the chicken well all over to allow the marinade to penetrate. 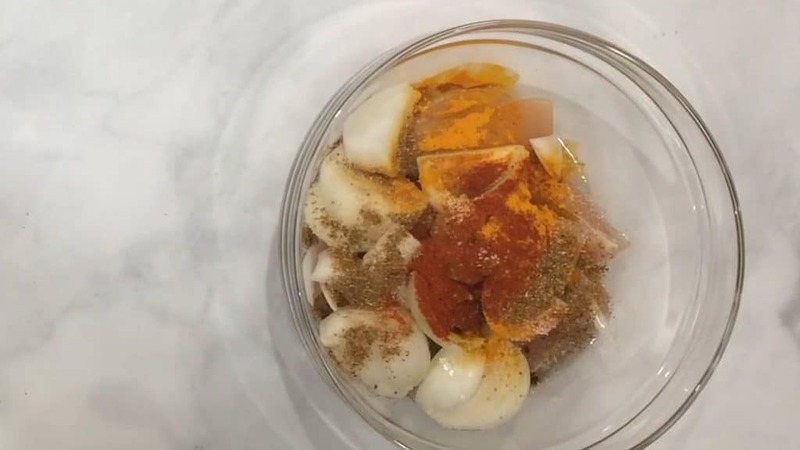 In a large bowl, mix together all ingredients and allow the chicken to marinate for at least 30 minutes, or up to 24 hours. 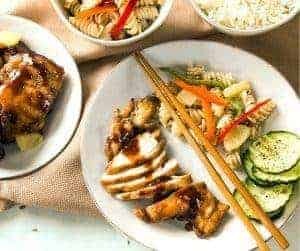 Place chicken and vegetables into the air fryer basket. Spray the chicken and onion with some vegetable oil. 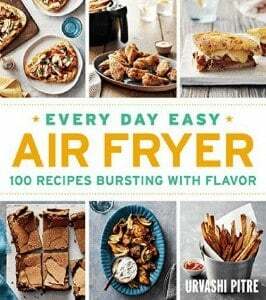 Set your air fryer to 360F for 15 minutes. Half way through, remove the basket, spray the chicken with more vegetable oil, and shake it about. At the end of the cook time, use a meat thermometer, ensure your chicken has reached an internal temperature of 165F. 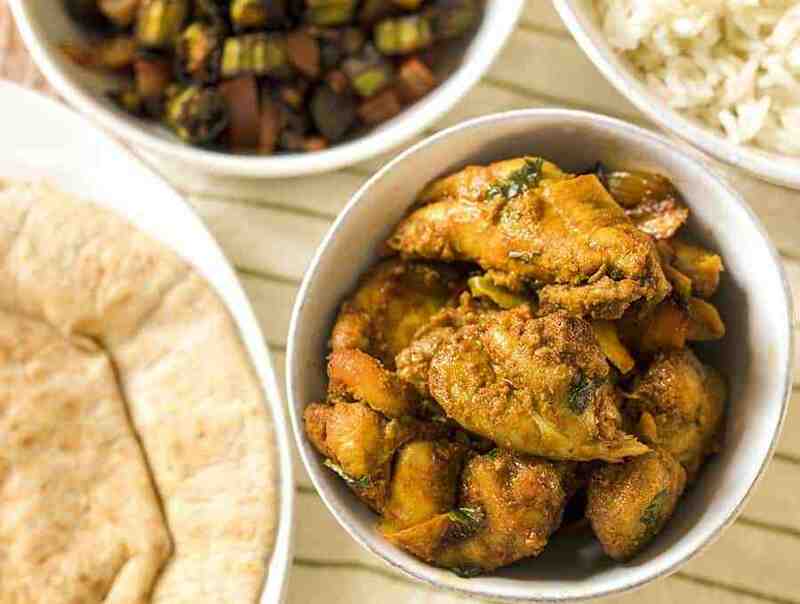 Remove the chicken and vegetables to a serving tray. Sprinkle with fresh lemon juice and cilantro and serve. 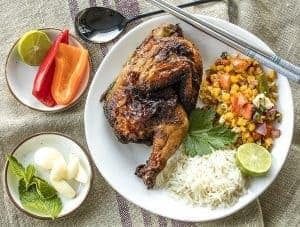 I’m going to make this with chicken legs. I don’t have thighs. Would this work and how would the the cooking time differ? I’ll leave out the red pepper 🌶 too. Hurts our tummys. Can I make this on stove top and or IP? when you say chicken and vegetables, what vegetables are you meaning please? I can only see an onion in the ingredients list. 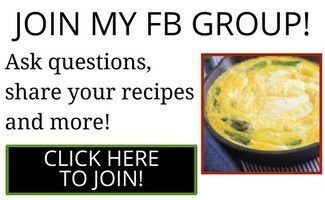 Im a sort of beginner cook! apologies! I made this today only because I didn’t have yogurt to make your air fryer Tandoori chicken (again). Wow, really loved it! I tried this weekend and it was fantastic! 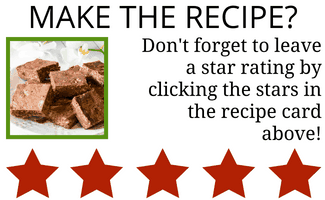 Thank you Uruvashi for another awesome recipe !